Ancient grains apple cranberry granola is a great way to start your day. 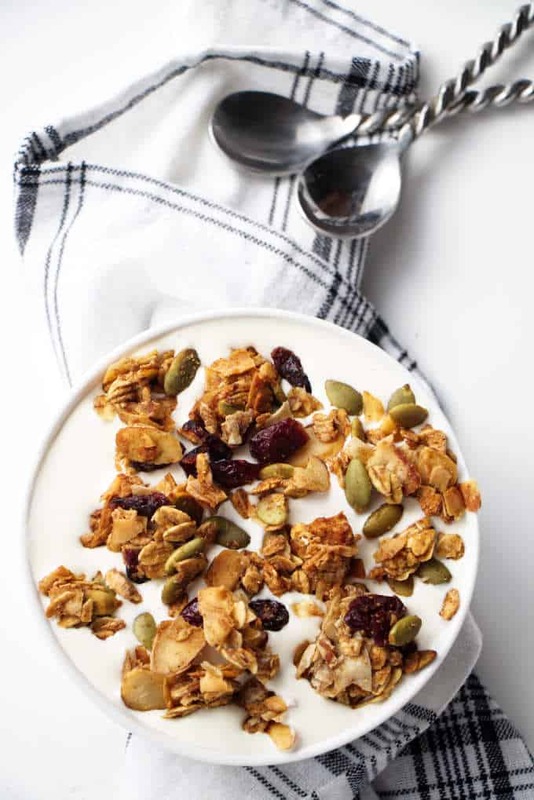 Top off your yogurt with this healthy granola and start your day the right way. Unlike most store-bought granola, there is NO ADDED FAT and NO REFINED SUGAR in this ancient grains granola. This is soft, clumpy granola made with ancient grains, chewy bits of dried apples and cranberries and loaded with crunchy nuts and seeds. This granola is naturally sweetened with honey and maple syrup along with the sweet and chewy bits of fruit. Our ancient grains granola does not have any oil added to it like most granola recipes. 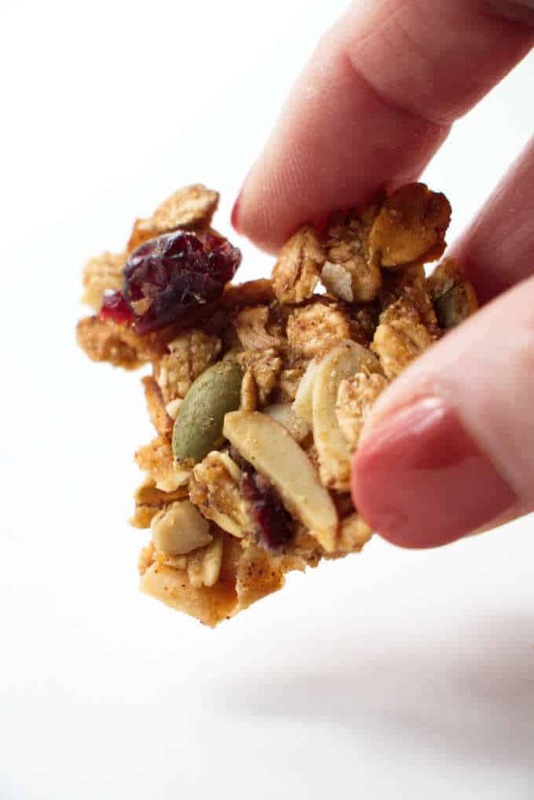 The only fat in the granola comes from the nuts and seeds. That is all good, healthy fat. The ‘glue’ for the clumping action comes from the egg whites and wet ingredients mixing with the barley flour. Since we used egg whites for the clumping action, the granola has an extra punch of protein. 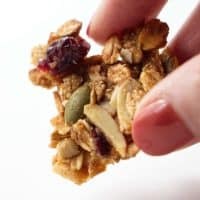 Not only does the barley flour and egg whites help clump the granola together, but the barley flour also makes the clumps of granola nice and chewy inside the clumps. Crunchy on the outside and chewy on the inside. It’s the perfect combination of textures. Ingredients for Our Ancient Grains Granola. I used barley flakes and spelt flakes for the base in the granola. Barley has three times more soluble fiber than oats and is considerably lower on the glycemic index scale than oats. It will keep you full longer and help maintain a more steady blood sugar level. Spelt is also high in fiber and adds a delicious nutty flavor to the granola. The nuts and seeds have healthy omega-3s and unsaturated fats along with fiber. They give the granola another layer of crunch and flavor. Dried apples and cranberries add sweetness and a chewy bite. Here’s a breakdown of all the ingredients. 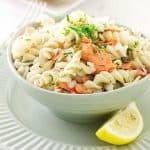 It may seem like a lot of ingredients but it is easy to make and since it makes a large batch, it lasts a long time. It’s worth the effort for healthy granola. Yes! You can freeze this granola! Preserve the flavor and healthy fats in the nuts and seeds by freezing the granola if you aren’t going to eat it all right away. Store it in a freezer-proof container and when you are ready to eat it, set it on the counter for about 10 to 15 minutes to thaw. 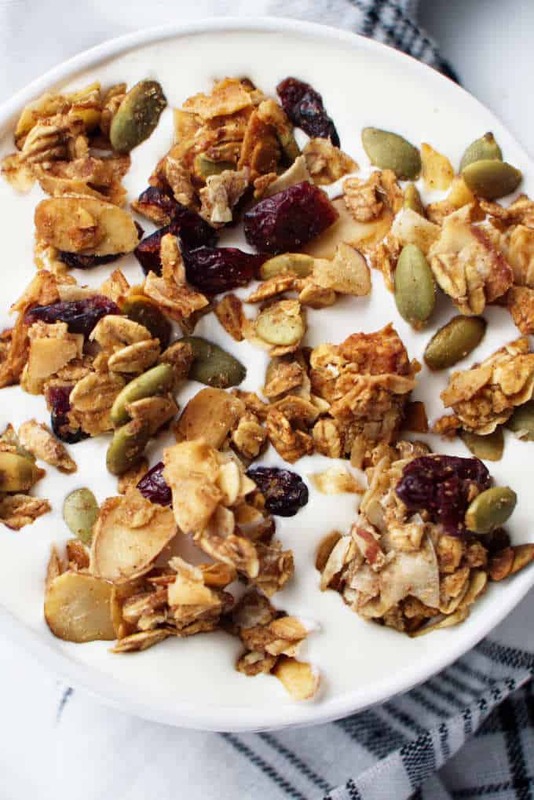 Supplies you will need to make this granola recipe. You will need a half sheet baking pan (18×13 inches) to fit the whole batch on one pan. If you use smaller pans then spread the batch out on two separate pans and rotate the pans halfway through the baking process. Parchment paper comes in really handy. It isn’t an essential item but it is definitely a convenient item. 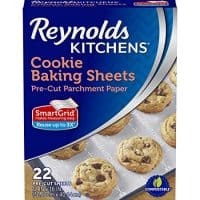 If you don’t like dealing with cutting parchment paper for your sheet pans then you can buy pre-cut sheets of parchment. 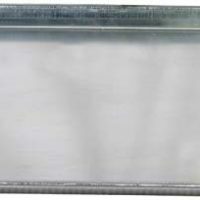 Another great option is to keep a silicone baking sheet in the kitchen. The trick to getting large clumps of granola. The trick to making sure you have large clumps is to limit how often you stir the granola. When it is baking, only stir it once for really large clumps and for smaller clumps stir it twice. When the granola is finished baking, let it sit on the counter to cool and do not stir it while it is still warm. 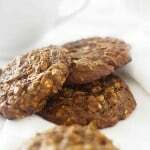 Chewy clusters of granola with no added fat and made with healthy ancient grains. Place the wet ingredients except for the egg whites, in a small saucepan and warm over medium heat until the honey thins out and everything is combined well. Pour the honey mixture over the dry ingredients then whisk the egg white and pour it over the dry ingredients. Stir to moisten everything. 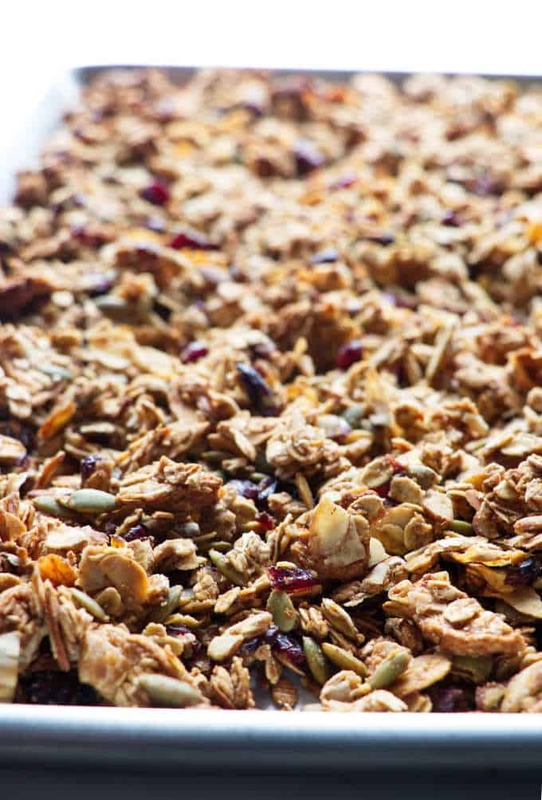 Dump the granola into the rimmed baking sheet and spread it out to the edges. It will come up to the edges of the pan, keeping the mixture piled up thick like this will keep the granola soft and chewy. Place in the oven and bake for 55 to 65 minutes, stirring every 20 minutes. The mixture will be toasty and golden. Remove from the oven and let it sit without stirring for 10 minutes (this will help it form larger clumps) then give it a stir and let it sit until completely cool. 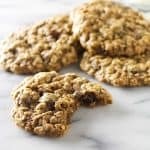 I used soft dried apples to help contribute to a chewy texture but crisp dried apples would work just fine in this recipe as well. You will need a half sheet baking pan (18x13 inches) to fit the whole batch on one pan. If you use smaller pans then spread the batch out on two separate pans and rotate the pans half way through the baking process. This looks great! Most commercial granola is way too sweet. And often includes ingredients I’d rather avoid. This is perfect! Nice recipe — thanks. So true John, thanks for the comment.